I’m just going to put this out there at the beginning: the Carnegie Museum of Art has a lot of weird stuff. Not that that should be entirely surprising from the city that brought the world Andy Warhol, but some of the stuff in the museum is just plain strange. However, that’s not to say that you shouldn’t visit. In fact, given that admission to the museum includes admission to the equally wonderful Carnegie Museum of Natural History, the museum is a great place to spend an afternoon looking at some of the most beautiful and interesting pieces of art you’ll find anywhere. Because I visited the natural history museum first, I actually started my visit on the top floor. However, should you opt to see the art museum first, or skip the natural history museum entirely, you’d be starting your visit on the first floor. Starting on the top floor from the Carnegie Museum of Natural History, the first thing you notice about the Carnegie Museum of Art is the stunning staircase. It’s no insult to the museum’s artwork to say that I think this architectural element might have been my favorite thing in the entire museum. It’s simply that stunning. The grand marble staircase and columns guide visitors through the floors of the museum. The main area of the Carnegie Museum of Art is on the second floor. This is where you’ll find everything from Contemporary Art to Ancient Art. The large breadth of the collection ensures that everyone will find something to enjoy. Baffling Contemporary Art at the Carnegie Museum of Art. My visit started in the Contemporary Art area, which was certainly jarring. It was Pittsburgh-native Andy Warhol who once said, “Art is what you can get away with.” And, nowhere in the museum is that more evident than in the Contemporary Art wing. While there were a few pieces that I could easily appreciate, most of the pieces left me confused. 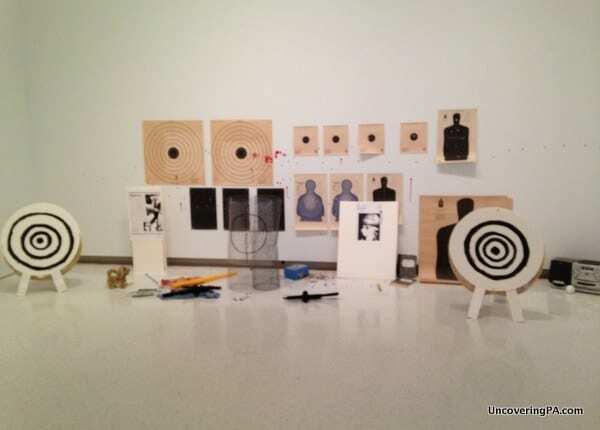 How a blank canvas, an old tv, or a room dedicated to a school shooter are art, I honestly don’t know. However, given that they are housed in one of America’s best art museums, I guess the artist was able to get away with it. As America’s first Contemporary Art museum, the collection at the Carnegie Museum of Art is impressive, if you enjoy this type of art. However, I didn’t find it to be as big or diverse as the Contemporary Art section at the Philadelphia Museum of Art. It also lacks a significant number of paintings from Andy Warhol, so many fans of his work may want to check out Pittsburgh’s Andy Warhol Museum as well. I was much more comfortable with the art featured in the Ancient to Modern Art galleries. Here, the pieces were more classic art; the type of art where you don’t have to be told why it’s art. In this area, some of the pieces were thousands of years old, and ranged from Asian to European to American. While most of the work was on canvas, there were a handful of statues in the museum, primarily from Asia. Having a particular interest in Asian art, I especially enjoyed this section of the museum. The museum also featured a collection of chairs from famous designers like Frank Lloyd Wright called “The Art of the Chair.” While you wouldn’t think of chairs as being artistic, some of these were clearly designed as art pieces first, without much thought given to the comfort of the sitter. However, there was something quite beautiful in art behind a normal piece of furniture. The beautiful grand staircase in the museum. On the ground floor of the museum are two galleries: one dedicated to sculpture, and one dedicated to architecture. The sculpture gallery features nearly 70 plaster casts of works from ancient Egypt, Greece, and Rome, while the architecture gallery features plaster caster of architectural elements from the same cultures. While it might sound a bit strange to have plaster casts, it does give visitors the ability to see a lot of amazing pieces that they might not be able to see in one place. Make sure to check out the plaster cast of the West Portal of Saint-Gilles-du-Gard, which is said to be the largest plaster cast in the world. Before you leave, make sure to head to the museum’s gift shop. Inside the gift shop is one of my favorite pieces of art in the entire museum: Andy Warhol’s pop art work of Andrew Carnegie. The piece might be the most “Pittsburgh” piece of art ever created and is definitely worth seeing before you exit. 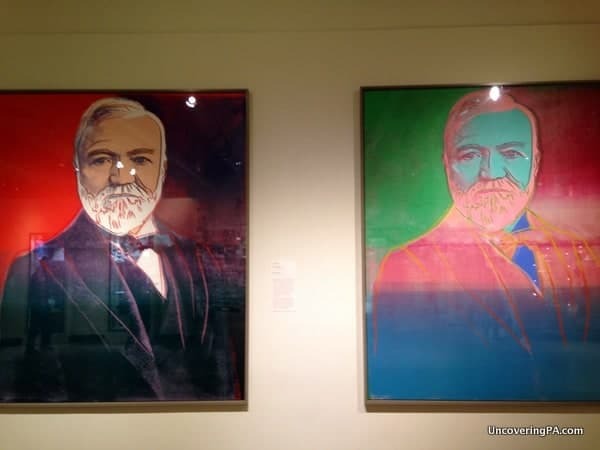 Andy Warhol’s painting of Andrew Carnegie which hangs in the museum’s gift shop. Overall, I really liked the Carnegie Museum of Art. Yes, there was a lot of weird stuff that I didn’t understand at all, but there was also a lot of really cool things to see. 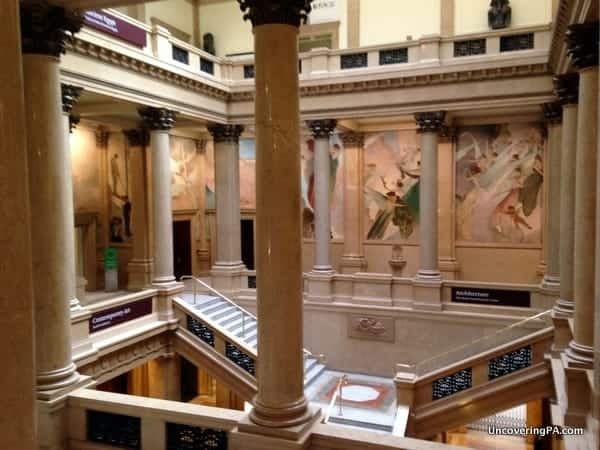 While the collection may not be as impressive as the Philadelphia Museum of Art, the Carnegie Museum of Art offers a great overview for those that, like me, aren’t huge art lovers, but want to see a well-curated collection. Since this museum is combined with the Carnegie Museum of Natural History for one price in one location, I would definitely recommend checking it out the next time you’re in Pittsburgh. Note: My visit to the Carnegie Museum of Art was hosted by Visit Pittsburgh. However, the opinions expressed in this article are my own. Loved your article about Randyland, Buttermilk Falls (I grew up in Beaver Valley and never saw that! ) and the metal at at Meadville. Can’t wait to plan a road trip there! Thanx for all the great shadings on your travels! Glad you like the site, Beverly. There are many great things to see in western Pennsylvania. Enjoy your travels!